Try this recipe for wonderful explosion of flavors in your mouth. One of my favorite summer fruits are nectarines, the fact that they come in so many different varieties makes it even more exciting. I used mango nectarines in this recipe but any other nectarine will do, mango nectarines have a delicious light mango flavor and withstand grilling temperatures with ease. "Chaat" is one of the most popular Indian street food snacks and includes an assortment of delicious savory and sweet items that are predominantly vegetarian. 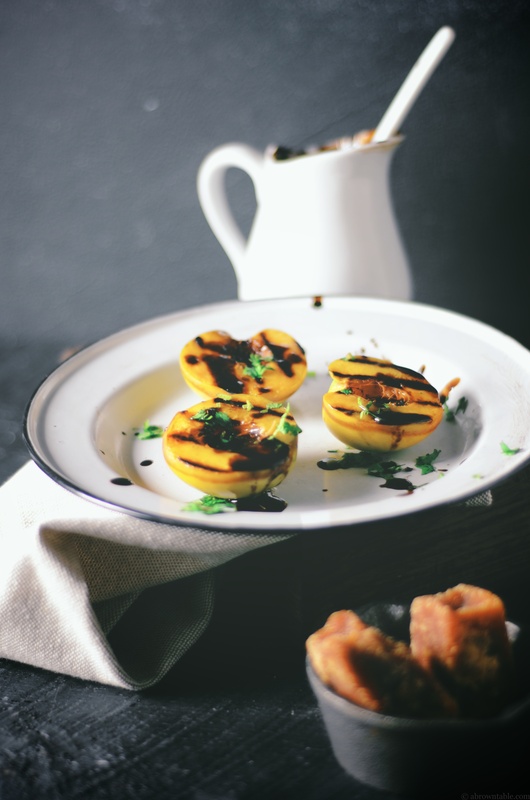 I've combined my love for summer grilling with this delicious Indian sweet and tart tamarind chutney that is often used in different chaat dishes. This recipe is easy and simple to make and is sure to provide a wonderful explosion of flavors in your mouth! Note: Some of the ingredients like the tamarind paste concentrate, the dry mango powder, black salt (kala namak) and jaggery can be found at most International food stores and even on Amazon. This recipe first appeared on A Brown Table on August 18, 2013. 2. In a thick bottomed saucepan, add 1 tablespoon of the ground chaat spice mix, the tamarind paste, water, jaggery(or brown sugar), and salt. Bring the contents to a boil on a high flame and immediately reduce to a gentle simmer and cook for another 5 minutes with constant stirring. Adjust the amount of salt if necessary. This sauce can be made in advance and stored in the refrigerator for up to 2 weeks or in the freezer for a month.